Is Father's Day for all dads, or just the ones with jobs? Is Father’s Day for all dads, or just the ones with jobs? Our playgroups put on new kiddy crafts each week. When a specific celebration comes around, they will usually revolve around that. So this week it was making Father’s Day cards. Unlike the mums who were helping/directing their children to create them, I just let my daughter do her thing – it seemed odd commissioning one from her. What was also odd were the actual cards they were supposed to end up with. 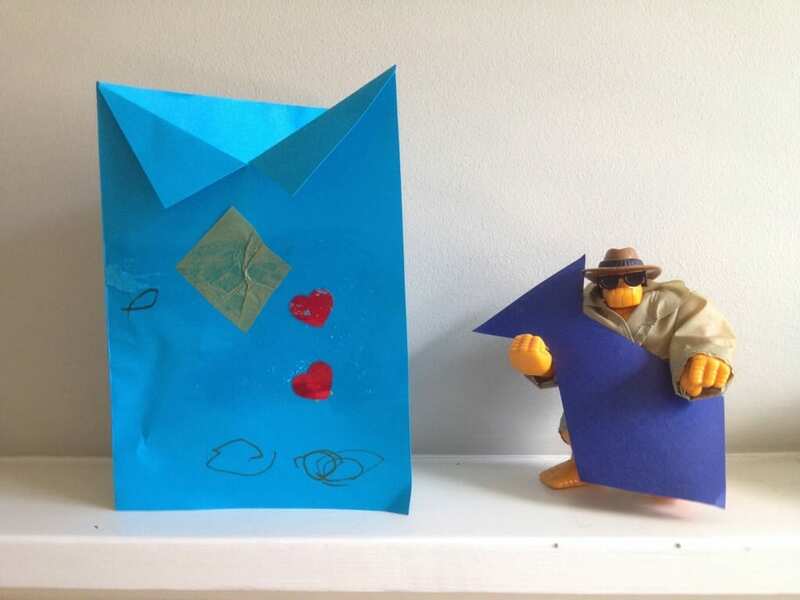 Two playgroups opted for the same concept – the front of the card had been cut and folded down to look like a shirt collar, and there was a cutout tie to glue into place. The inference was clear (despite the fact I have only ever worn a shirt & tie for weddings and funerals): A father’s role in the family revolves around having a job. This is also the role that retailers like to cast us in. Gendered marketing to children is an issue I take great interest in, unhappy as I am about commercial interests defining, from even before birth, what they think a boy or girl should be. But what about gendered marketing to adults? How does that affect us? I adore my current role in life as one of the growing army of stay-at-home dads. It has come about mostly from my long-held desire to do this, with financial circumstances supporting that choice (ie. My wife earning more than me). Frankly, it’s been a blast. Out & about doing baby & toddler things with my daughter, I’ve gotten to know some dads, but mostly mums – and the fact is that in terms of being a parent I have far more in common with the at-home mums I meet than most working dads. The offering around Mother’s Day tends to be all about ‘giving mum a break’ – from cooking, cleaning, childcare, etc. Brunches and pampering packages abound. What about Father’s Day? Traditional gifts revolve around either ‘work’ related gifts like smart socks, shirts, and ties, or ‘play’, things that are thought to keep men sane during the 9 to 5 – booze, sports, and gadgets. But there’s no sense that fathers like me – stay-at-home dads – also need a break from their routine and responsibilities. By packaging the days in this way, retailers are reinforcing the idea that being the homemaker is a mother’s role, while that of breadwinner is still the father’s. I think these marketing driven definitions contribute to the guilt that many mothers feel about wanting to return to work, and lessen the chances of men admitting they would dearly love to be stay-at-home dads. Society follows suit – while we have the term ‘working mother’, the male equivalent would be recognised as ‘father’. I’m a ‘stay-at-home dad’, but for female counterparts ‘mum’ seems to suffice as a label. I have generally felt ambivalent about Father’s Day since childhood, and I continue to do so as a father. Perhaps because my birthday is also only a few days away, and it seems greedy to have 2 ‘special’ days in one week. My cynical side also tends to judge Father’s Day as a way to package and sell more stuff, much like Halloween. We have no out of the ordinary plans for the day – I will spend it with my wife and daughter, like most other ideal Sundays. Then again, perhaps there is a purpose to ‘Father’s Day’? It has serendipitously coincided with the start of the Football World Cup. I could cynically take advantage of it to watch a couple of back-to-back games? Reverting to stereotype, I am a dad that likes watching football. And having a break from my routine and responsibilities. I think those cut down cards with ties must be standard issue – my daughter made her Dad one of those too at nursery – I saw them waiting when I dropped her off. It was only because I was running late that I didn’t tell them what I thought (but also, I worry about offending the staff who probably didn’t make the decision but who worked hard helping the children to make the cards, which *is* a nice to do) but I didn’t like the idea of shirt & tie representing all dads. The father’s day party that nursery put on was also a football match. Thankfully my husband loves football, both playing and watching, but still, made me wonder what other stereotypes the nursery reinforces, especially since the mother’s day option was pampering, tea & cakes and makeup/manicures (which I enjoyed, personally, but not every one would have done). Ps. Happy birthday. We not only have the double whammy of father’s day, husband’s birthday but also wedding anniversary. We are not sure what to celebrate when this weekend! Thanks for the birthday wishes, and I reckon a family celebration day sounds like a great idea! Gender stereotypes are a hard thing to cope with sometimes, and as you point out, they don’t just affect kids! I think it’s awesome that you’re the stay-at-home parent, and it’s really too bad that more Dad’s don’t get the opportunity to do so. 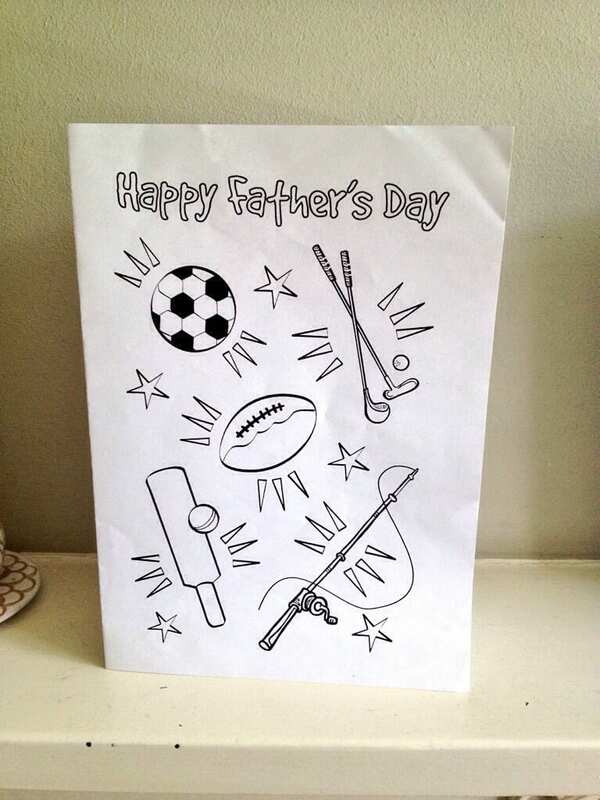 I would take your observation about the Father’s Day card a step further even and say that not only are they often designed for “working Dad’s” but they’re designed for white-collar working Dads. I never saw my dad wear a tie growing up unless it was a super special occasion–but he worked everyday, and often worked overtime as a maintenance mechanic. I’m not sure we really need as many holidays as we’ve created for ourselves, but I do think it’s important to take some time to thank all the hardworking parents for all the love and care they show their family. So Happy Father’s Day! And maybe you’ll get a chance to watch the Football matches afterall–not because it’s a MAN THING to do, but because you like to watch it, and you deserve a break too! Yes, that’s true too – and these days even ‘white collar’ workers probably don’t wear a tie. It’s a bit depressing that for a day titled “fathers day”, the images used are work related and not parent related. Even if you wore a suit every day of the year, do people (working dad and mums) really want your kids to remind you of the fact that the only time they see you is what you wear when not around them, rather than the person who plays with them, reads to them, makes them tea and all the other things you try to fit in outside of the activity that takes you away from them (work)? I love the fact that as a shift worker I get to go to kids groups and actually see them enjoying being kids, rather than just making them breakfast as I run out the door and tucking them in at night. I don’t see it as giving my wife a break, but an opportunity to spend time with some of the most important people in my life. For what it’s worth, my wife and I decided, as she earnt more, I was going to look after the kids. Yet she loves being a mum so much, she changed her mind, and doesn’t regret that choice. But it’s something we had the option to discuss, rather than having the social expectation pushed on us. Happy Fathers day to you and your family, and enjoy the football. Thank you – hope you guys have a nice day too. Unfortunately teachers can’t come up with an individual craft plan for every childs parental situation, so have to aim for the ‘normal majority’. This means that dads like you and myself have to be brave, not take it to heart, get over ourselves and concentrate on what is important, being there for our kids and chatting up mums at playgroups! They don’t need to: Blank cards (or with a simple Happy Father’s Day message), glue, glitter, tissue paper, cutouts, etc. and let the children create something themselves, instead of a putting together a pre-determined concept of what they think a father should be. Anyway, the post wasn’t intended as a dig at the playgroups, so sorry if it came across that way. The cards were what provoked me to write the post, hence its inclusion, but really was targeted at wider marketing & gender role issues. I appreciate the hard work of the (mostly) volunteers – I even help run a playgroup myself, though we didn’t do Father’s Day cards. And I reckon the bravest thing I do each week at playgroup is lead a roomful of mums (& toddlers) in the singing. I can’t sing and my voice is so much lower than everyone elses is stands out a mile – I’m amazed they come back! Thank you for sharing this. I, too, never paid much attention to Father’s day. I too am a stay at home dad. I too am experiencing my first Father’s Day as a blogger. This is the first time I’ve been privy to the bevy of Dad love surrounding the holiday. Some say it’s the first year that it’s been like this, the year of the dad. But it has been remarkable. So much focus in the media this week on physically present and emotionally available fathering. So much establishment of a community that rallies around and touts the merits of active and involved dads. I’ve never been more proud, honored, humbled and eager to keep being the best dad I can be for my two young daughters. I think being an at-home dad only seems ‘odd’ if I let it be. In my day-to-day life with my daughter, I do all the things with her that any engaged parent would, and other parents, grandparents & other carers I’ve gotten to know treat it as a normal situation because I do. I read there are some mothers who resent males entering into their previously female space, but that’s not an experience I have ever had with any mothers. Pingback: Is Father’s Day for all dads, or just the ones with jobs? Well at least you like football…my poor husband (who is stay at home Dad to my daughter doesn’t even have that reference point). Mean while at work my job could hang in the balance due to metrics that are know to bias against women but my employer uses to rate my usefulness anyway. It would be so nice if we were all just people. But the pink- / blue-ification of babies makes that impossible from the word go. Great post. I’ve also often wondered why we get the label “stay at home dad” when surely dad / father would do. I think that you make a lot of good points here about how Fathers’ Day cards stereotype dads. Even as a working dad, I can’t really identify with the shirt and tie cards as I rarely wear a shirt and tie at work. I guess that the other typical images (beer, cars, sports) are based on a fairly stereotypical idea of what dads like. Sport certainly fits for me, although the other two don’t. I guess it’s another example of commercial firms being slow to cotton on to how masculinity and fatherhood is evolving.